Artist Anish Kapoor has complained of plagiarism following reports that a sculpture similar to one he made for Chicago has been constructed in China. "It seems that in China today it is permissible to steal the creativity of others," he said in a statement. According to Chinese media, the stainless steel work in the town of Karamay, north-west China, is intended to represent "a big oil bubble". 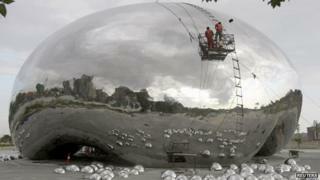 Kapoor's original, named Cloud Gate, was unveiled in Chicago in 2006. The sculpture, which reflects Chicago's dramatic skyline, is known as The Bean. It featured prominently in Source Code, a 2011 thriller starring Jake Gyllenhaal. "I feel I must take this to the highest level and pursue those responsible in the courts," Kapoor said. "I hope that the Mayor of Chicago will join me in this action. "The Chinese authorities must act to stop this kind of infringement and allow the full enforcement of copyright." An employee of Karamay's tourism bureau denied that the Chinese sculpture was a copy of Kapoor's, insisting any similarities were coincidental. "While we use similar materials, the shapes and meanings are different," Ma Jun told the Wall Street Journal's China Real Time blog. "Cloud Gate intends to reflect the sky, but ours reflects the ground." Piracy of goods, brands and copyrighted materials is so rife in China that there is a word for the results - Shan Zhai, a term originally used to describe a bandit stronghold outside government control. Anish Kapoor is known for works including the Orbit tower in London's Olympic Park and the Sky Mirror in Nottingham. His more recent works include Dirty Corner, a 60m (200ft) steel tube in the gardens of France's Palace of Versailles, which has caused controversy and has been the target of vandalism.